Tickets for the Portland Pale Ale Invitational are $30 and will be available online starting on March 1 at http://www.pintsforprostates.org/ or through the secure link at eTix. All net proceeds support the mission of the Pints for Prostates campaign. The Oregon Brewers Festival is one of the nation's longest running and best loved craft beer festivals. Situated on the west bank of the Willamette River, with towering Mt. Hood as a backdrop, it is the ideal venue for anyone who loves craft beer. With a laid back attitude and scores of award-winning beers, the festival reflects the essence of the city of Portland, and is the crowning jewel of Oregon Craft Beer Month. The OBF was at the forefront of exposing craft beers to the public. A total of 84 craft breweries from all parts of the nation will serve more than 30 beer styles to nearly 80,000 beer lovers from around the world. Another 50 specialty beers will be available for tastes in the Buzz Tent. German Chancellor Angela Merkel was attending the annual Ash Wednesday meal held by the Demmin Christian Democratic Union in Mecklenburg-Western Pomerania when a 21-year old waiter, identified only as Martin, became an instant You Tube phenomenon. Merkel had just arrived at her table when Martin rushed over with a tray of cold beers, making sure he served one of the world's most powerful women first. He later told reporters he was a last minute substitute for a female waiter who was too nervous to serve the German leader's table. Five glasses of lager end up on Chancellor Merkel's back, but she hardly reacts. Merkel raised a toast to the table and later gave a speech to the gathering. I guess if you spend enough time in German beer halls you have to expect the occasional beer shower. Which leader of the free world would you like to hoist a pint with at your local pub? Missing from the list are two presidents that knew a thing or two about beer: Thomas Jefferson, who brewed at Monticello, and Franklin Roosevelt, who lifted the tyranny of Prohibition. Jimmy Carter, who signed the bill that exempted homebrewed beer from excise tax, is also missing from the list. Oddly, George W. Bush makes this list even though he is said to have stopped drinking long before entering the White House. Abraham Lincoln might also raise some eyebrows, since he implemented the first tax on beer to help fund the Civil War. Nightclub & Bar magazine has released its 2012 Top 100 list of nightclubs, bars and lounge venues. The list is dominated by venues in major markets, with eight of the top 10 located in Las Vegas, Nev. The list is topped by Marquee Nightclub & Dayclub in Las Vegas, which reported revenue in excess of $70 million for 2011. 5. LIV ($35-$45 million), Miami Beach, Fla. According to Nightclub & Bar magazine and Technomic, which compiled the list, members of the Top 100 list generated revenue totaling $1.4 billion. The Nightclub & Bar Convention and Trade Show will be held March 12-14 in Las Vegas. Tuesday Tasting is a regular feature of Lyke2Drink that explores some of the best beers, wines and spirits on the market. This week we sample a pair of brews from a Brazilian microbrewery. Paulo de Tarso Cavalcanti of Cervejaria e Escola Bodebrown brought some of his beers to the Raleigh Rare & Vintage Beer Tasting last weekend. The event was held at Tyler's Restaurant and Taproom and raised funds for the Pints for Prostates campaign. Bodebrow Strong Scotch Ale Wee Heavy is 8 percent alcohol by volume. The beer won a gold medal at the Mondial de La Bierre in Montreal in 2011. The beer pours a reddish brown with a off white head. There is a nice caramelized malt base to this beer with just a faint hint of smoke in the background. The mouth feel is not as heavy as some other wee heavy Scotch ales on the market. Bodebrown Perigosa Imperial Milk Stout comes in a couple of strengths. The beer getting most of the crowd noise at the event in Raleigh was the 21 percent alcohol by volume giant that is aged in Hungarian oak and former Bourbon barrels. The beer is a thick black pour with a minimal head. There is a sweet and roasted nose that opens up as the beer warms slightly. The beer is full flavored with tons of dark fruits, wood and chocolate throughout. The high alcohol content is not a major component of the flavor. Wynkoop Brewery Names Three Finalists for "Beerdrinker of the Year"
Wynkoop Brewery is getting set to host its annual Beerdrinker of the Year competition and the three finalists have impressive beer drinking resumes. If you are around Denver on Feb. 25 you might want to stop in for the finals. Warren Monteiro, a New York City freelance writer, beer traveler, homebrewer and BeerSensei columnist for Alestreet News. Monteiro has sampled beers in Europe, Central American, India, Sri Lanka, numerous other nations and throughout the United States. In 2011 he visited breweries and beer festivals in England, Belgium, the Netherlands and the US. He samples an average of 350 beers each year. His home beer bar: Blind Tiger Ale House, New York City. Greg Nowatzki, a Las Vegas, Nevada accountant, home brewer and beer judge. Nowatzki has tasted over 13,600 beers from 84 different countries and all 50 states in the U.S. He has visited over 500 breweries in 32 different states and the District of Columbia, and attended over 150 beer festivals in 8 states. In 2011 he visited 16 beer festivals (including an 11th consecutive Great American Beer Festival) and visited over 100 different breweries in 7 states. His home beer bar: Big Dog’s Draft House, Las Vegas, Nevada. J. Wilson, a Prescott, Iowa writer, homebrewer, beer judge and beer blogger. He has a three tap, 8-foot home bar supplied by a 10-gallon brewing system in his basement. An advocate for beer for 15 years, he organized numerous beer events in his hometown in 2011. The past year was highlighted by a research project in which he fasted for 46 days on water and a dopplebock he brewed with a local brewery. It became a book, Diary of a Part-Time Monk. His home beer bar: El Bait Shop, Des Moines, Iowa. The judging takes place at Wynkoop on Feb. 25 at 2 p.m., when the finalists face questions from a panel of previous Beerdrinkers of the Year and beer experts. More information is available at http://www.wynkoop.com/. 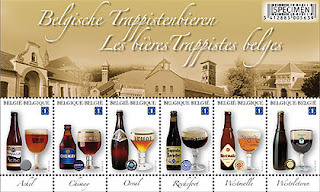 Belgium is the home of six of the world's seven Trappist breweries. Belgian Post recently issued a special set of stamps to recognize these amazing Belgian beers. The stamps feature bottles, caps and glasses filled with Achel, Chimay, Orval, Rochefort, Westmalle and Westvleteren. It is not the first time that postal officials in Belgium have celebrated the national drink with special stamps. A total of 174 Trappist monasteries exist worldwide. Six in Belgium and one in the Netherlands still brew beer and are approved to use the Authentic Trappist Product logo that indicates compliance with the rules of the International Trappist Association. Originally, Trappist monks brewed for the needs of the monastery. Now money raised through the sale of beer fund good works.